For weeks (months?) before the end of the fall 2012 semester, I looked forward to winter break because I'd have time to read many books of my choice, and not just books and student essays that I have to read for work. And now my break is more than half over and I haven't finished reading any for-fun books yet! And if you caught my post on New Years Day, you'll know one of my goals is to read more for-fun books. 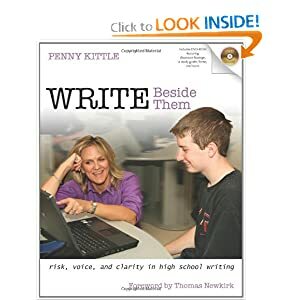 I read Write Beside Them by Penny Kittle in its entirety, but that's a work-related book to help me incorporate my own writing practice into my teaching of writing. (I highly recommend this book to any and all writing teachers out there). 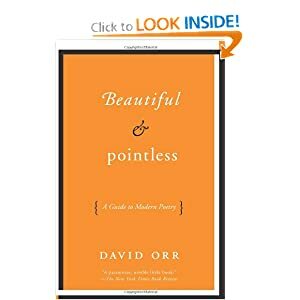 I am about 25% through Beautiful & Pointless: A Guide to Modern Poetry by David Orr. That's not specifically for school, but it's not specifically for-fun either. I used to be very interested in reading and writing poetry, and then suddenly I wasn't anymore, and it became a foreign language. I hoped this book would make poetry seem more accessible again. 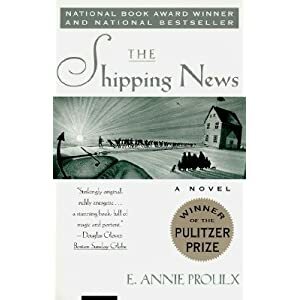 I am on page 100 of The Shipping News by Annie Proulx. I'm not getting into this book and I don't understand why. It's beautifully crafted, the characters are interesting, the situation is unique. It has all the elements it needs, but I feel like I should be reading something else right now.